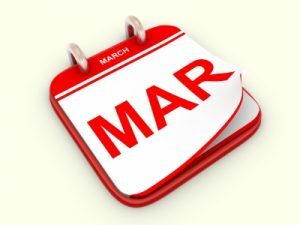 Welcome to your March newsletter. This month, we discuss the self-assessment deadline; did you get yours in on time, did you file online, or are you yet to submit? Elsewhere, the countdown to Real Time Information (RTI) is into its final month – is your business prepared? We also explore calls for the March Budget to be re-asserted as the key annual announcement on fiscal and economic policy making; could it be the end of the Autumn Statement as we know it? Finally, with the end of the tax year fast approaching, we explore the tax savings and allowances you may want to take advantage of. Are you one of the 9.61 million people who filed their tax return on time this year? HMRC data reveals that this year marked the largest number of individuals ever to get their returns in on time, before the two deadlines; 31 October for paper returns and 31 January for filing online. Of this number, 7.93 million were completed online, while the remaining 1.68 million were paper returns filed by post. According to HMRC, 10.34 million people were required to complete self-assessment tax returns for the 2011-12 tax year, meaning that 92.9 per cent met the return deadlines. However, it seems that many chose to put off their returns until the very last minute. HMRC received more than half a million returns on 31 January, its busiest recorded day. The busiest period occurred between 16:00 and 17:00, when 46,000 – more than 12 per second – were received. The Christmas holidays were also a busy period for returns, with 1,548 sending their returns in on Christmas Day and 4,685 on Boxing Day. Around 27,161 were also filed online on New Year’s Eve and a further 12,077 submitted on New Year’s Day. Those who failed to submit a return will have already incurred a £100 late-filing penalty, with additional penalties being incurred after that. HMRC has advised those who have yet to submit their return to do so as soon as possible and pay any outstanding tax owed. Don’t leave filing your returns until the last minute. We can help you file your self-assessment tax returns accurately and on time. RTI comes into force for some employers and pension providers in April and for all employers by October. Are you doing all you can to prepare? Designed to modernise the PAYE process and to support the new Universal Credit welfare system, RTI will require employers to tell HMRC about PAYE payments in real-time when they are made, and not at the end of the tax year. Some tax forms will change or be discontinued completely. The changes regarding new starter and leaver processes. Talk to us to see how else we can help you with RTI. End of the Autumn Statement as we know it? The Chancellor’s March Budget and Autumn Statement form two of the most important dates in the financial calendar, containing the Office for Budget Responsibility (OBR) economic forecasts on which fiscal policy is based. Historically, the Budget acts as the main source of economic policy decisions, while the Autumn Statement provides an update on the state of public finances. Recently, however, the Autumn Statement has been used to announce changes to tax and policy. In January, a treasury Select Committee report criticised the ‘second Budget’ role that has been given to the Autumn Statement. MPs said this had the effect of creating uncertainty for businesses and additional costs for the tax payer. The Committee argued that the March Budget should be re-established as the main focus of policy making. An actual ‘second Budget’ should, it said, only be used in an emergency situation where it would carry a long-term benefit. Elsewhere, the Committee report raised concerns about inadequate time allowances for MPs to properly scrutinise the Finance Bill, the Bank of England’s decision making process, the effectiveness of the Funding for Lending Scheme – designed to boost credit to small businesses – and uncertainty surrounding planned increases in fuel duty. This year’s Budget will be held on 20 March. ISAs allow you to invest your money in a tax-efficient way and, while the amount invested does not attract tax relief, any income and gains on the investment are tax-free. The total amount that can be invested into an ISA for 2012/13 is £11,280, of which a maximum £5,640 can be invested as cash. The remainder can be invested into stocks and shares. The ISA allowances increase on 6 April for the 2013/14 tax year. You will be able to invest a total of £11,520 in an ISA, of which the cash subscription limit will be £5,760. Junior ISAs have also been available since November 2011 to those aged under 18 who do not hold a Child Trust Fund. The total Junior ISA limit for 2012/13 is £3,600, which can be invested into a cash ISA account, stocks and shares, or a combination of the two. Anybody can pay into the Junior ISA and the money belongs to the child. The child cannot take it out until they turn 18, at which point the junior ISA will automatically become a full ISA. To encourage saving for retirement, the Government allows individuals tax relief on investments up to £3,600 per year (gross) into a personal or stakeholder pension scheme or 100 per cent of your earnings – whichever is the greater. This is capped, however, at the annual allowance. For the 2012/13 and 2013/14 tax years, the annual allowance is £50,000, with the Government announcing this will decrease to £40,000 for 2014/15. The lifetime allowance is the maximum amount of pension savings you can build up throughout your life that can benefit from tax relief. The lifetime allowance for the 2012/13 and 2013/14 tax years is £1.5 million. This will also fall for 2014/15, to £1.25 million. Please talk to us to discuss the tax relief available for this tax year, or to plan for the next.